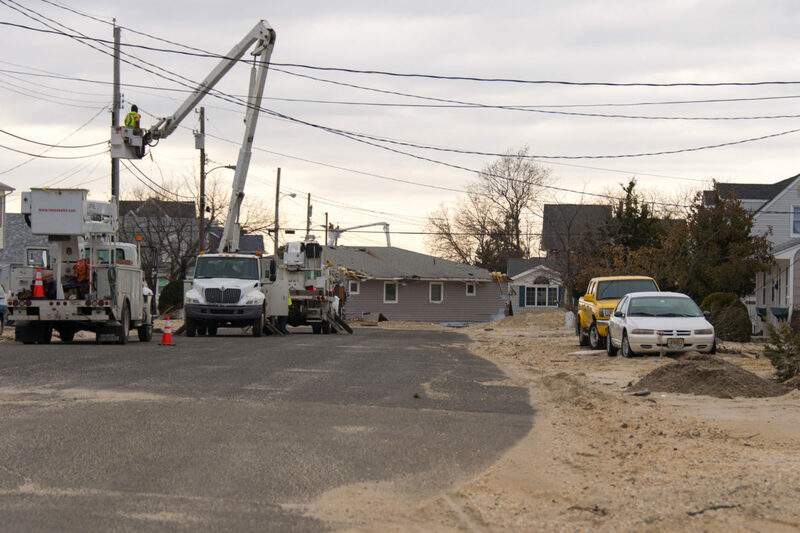 This is just some of the damage to homes by Hurricane Sandy in Union Beach, New Jersey that I saw last week while covering a companies work there. Ken is one of my mentors helping me with business practices. My good friend and fellow photographer Ken Touchton, pointed out to me how we are called on day to day to cover the ordinary and make it look extraordinary. The camera manufacturers and even our professional organizations often have photographers who create some cool photos doing their “dog and pony show” at seminars and workshops. Many of these photographers create these incredible images which help them to be professional speakers and lead workshops. My hats off to these guys. They do an incredible job and create some outstanding images. The reality is that in my lifetime I will most likely have very few if any of these types of photo assignments. Lately those photographers on tour are no longer using dogs and ponies. Now they have elephants, dancers and just find the most exotic people and places to capture. It does make sense that to have a great photograph start with great material. It would be fun to have the budget to hire a few exotic animals, a few models and fly them all to an exotic location. I also think it would be cool to have all that equipment to light the subjects and make a truly memorable photo. However, Ken and I are often called on by companies to tell the stories of normal every day folks doing what may visually appear to be mundane, but are truly extraordinary. This is some of my coverage of Chick-fil-A cooking sandwiches that they do everyday and giving them to people in need. Chick-fil-A has a food truck that they use to distribute sandwiches at large events. 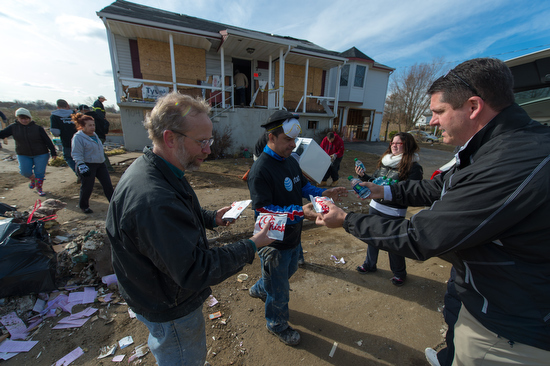 Here it is in Howell, NJ where they were distributing sandwiches to Hurricane Sandy victims, first responders and volunteers. 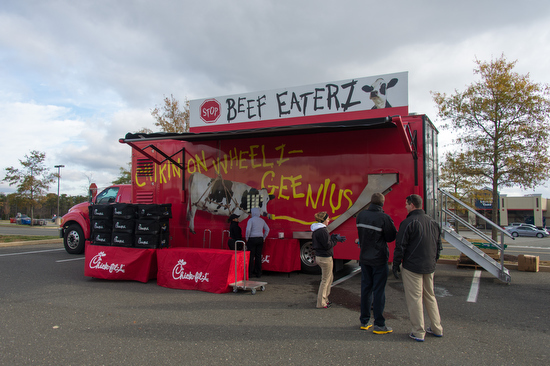 In total over four days, Chick-fil-A’s food truck produced and distributed 13,650 Chick-fil-A Sandwiches to folks in northern New Jersey and Staten Island. 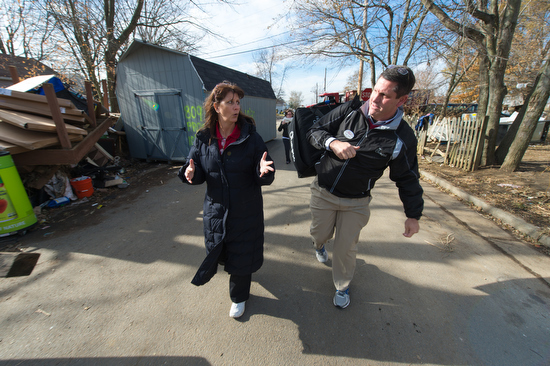 My objective was to capture Chick-fil-A personnel giving away sandwiches to those affected by Hurricane Sandy. When in a disaster I don’t get to scout the area and then plan which models to bring in for the photo shoot. I don’t get to come in and light the scene to make this pop as I might do in an advertising photo shoot. This is finding moments as they happen to tell a story. These moments were in short one to two minute intervals of the volunteers giving out sandwiches. It doesn’t take long to give them a sandwich and give a quick word of encouragement. 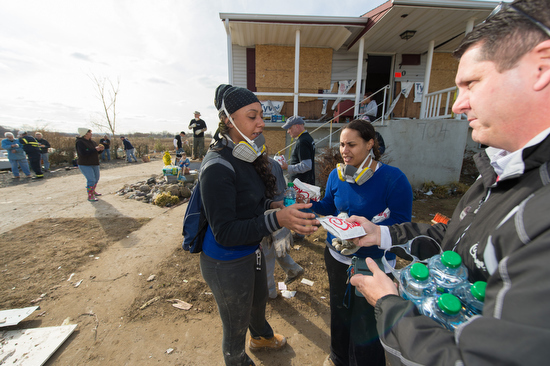 The hardest part of the coverage was showing people receiving sandwiches that you could tell by the visuals alone they were part of a disaster. I needed the food distribution and I needed to show this was about Hurricane Sandy. The photo above comes very close to communicating the two in the same photo. One of my favorite photos from my coverage isn’t necessarily the best storytelling shot, but I love the motion of the Chick-fil-A personnel walking down the street of Union Beach, NJ where there is major damage. You can see all the debris stacked behind them that had to be cleared off the roads for vehicles to get into this neighborhood. Most of the time in disasters people are in the centers where people can come to get clothing, counseling or information about their homes. 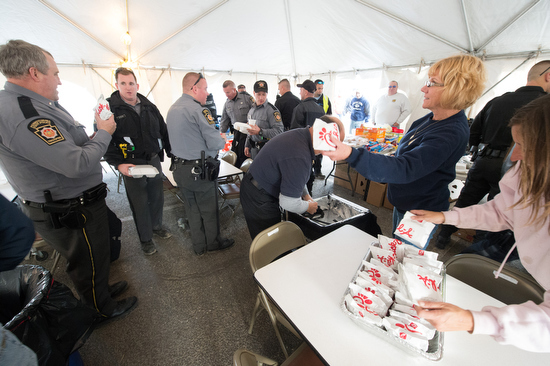 While the photo above of food being distributed to the first responders communicates the food distribution it lacks the context of Hurricane Sandy without some text. While you can put a series of photos together on a page to help tie the communication package into a more cohesive package, the photojournalist is trying to do this with one photo, because often that is all the space they have. In all of these photos I was what I call running and gunning. As a photojournalist I don’t stop people and ask them to do it again. You keep the camera up to your eye a lot of the time and quickly fire shots as they come up. Now when I shoot for a company where we need certain things to look a certain way it is OK to make changes–it isn’t photojournalism it is advertising or corporate communications. However, my photojournalism background helped me stay focused during my coverage. Chick-fil-A was on a timetable of delivering these sandwiches to people in less than 20 minutes. They know that food safety is important and also gives the customer the best experience. If you look closely you will notice they are on the move in giving these sandwiches out to people. I wanted to show how at times the photojournalist will use on camera flash in a fast moving situation to help hold some of the shadow details. In the photo above I was believing this would work OK since the skin tones of the people getting sandwiches was light. When the darker skinned volunteers came up and they were all backlit I didn’t want to risk not seeing their faces so I put on the Nikon SB 900 and using the high speed sync mode and slow-sync was able to pop a little fill flash ensure I was capturing people’s faces. Another side note you can see how I altered the frame in the two photos. I don’t need multiple shots with just the people changing, I wanted to tell more about the location, but had no time to move around. 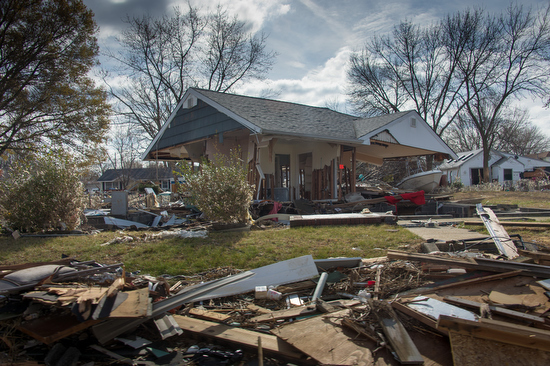 I just composed to show how the devastation to the left of the house was there in the second photo. By the way we were in this location for less than five minutes. We had hot sandwiches that needed to be delivered to more places. come two times. He and his family really appreciate the gesture. It is due to all my training as a photojournalist that companies need me. They cannot turn the hurricane disaster coverage into an advertising location photo shoot. They need a photographer that can in any situation come away with photos that communicate. 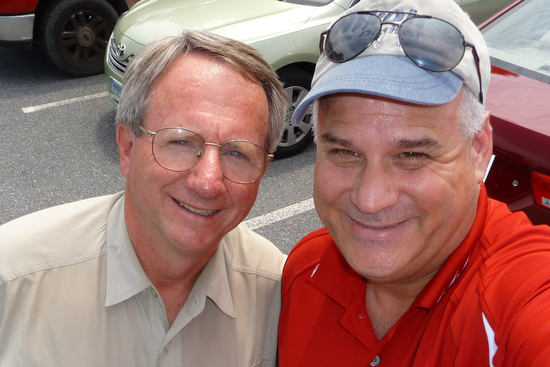 Ken Touchton and I are going to the Atlanta Photojournalism Seminar next week the first weekend in December. It is their 40th anniversary and Ken was there 40 years ago. I am also one of the organizers for the Southwestern Photojournalism Seminar that is March 1 – 3, 2012. Both of these are great places to learn from storytellers and ask them how they handle situations. Many of the speakers are photojournalists who also shoot commercially. Maybe the reason some of them make great advertising photographers is they know what looks authentic and have a knack for helping creating those impactful moments. I still advise anyone starting in this industry to try and get a job with a small town newspaper. The experience gained from shooting day to day assignments will help you know how to get the best possible photo in any situation. It will also help you appreciate the ability to plan and do preproduction to get those advertising shots where you are in control.